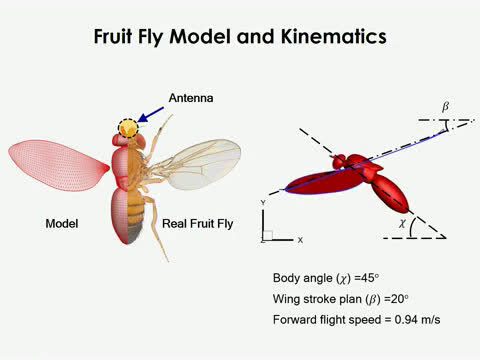 Fruit flies don't appear to use their tiny, translucent wings for optimal flight, as one might expect. The speedy appendages seem to be doing double duty, helping the insect sniff out food, mates and other important scents, according to new research from The Ohio State University. A researcher with a background in mechanical engineering and an expert in olfaction—that's smelling to most of us—collaborated on the study, which appears in the journal Nature Communications. Scientists have long wondered about the balance between an insect's dual needs for flight and odor-based navigation. Inevitably, the wings disrupt odor plumes and that led many researchers to speculate that nature might not have designed the wings just for flight, but to draw aromas to the scent-detecting antennae as well. Each of the Ohio State researchers was skeptical about this dual-purposes hypothesis for his own reasons. 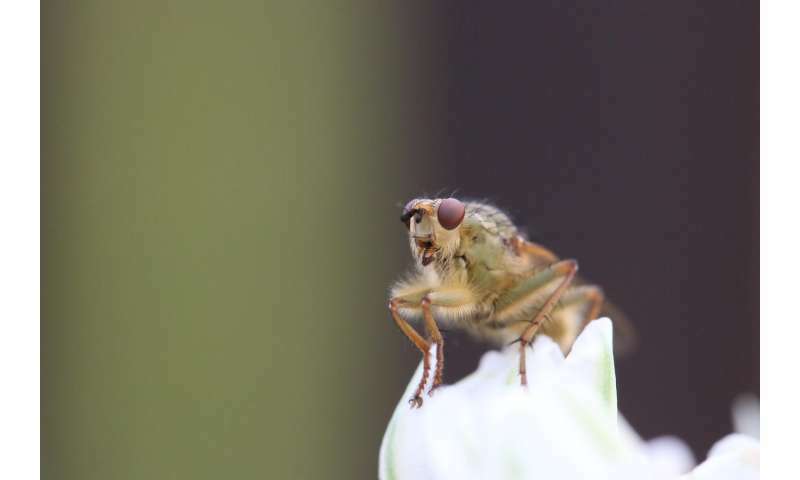 Kai Zhao, the olfaction and bioengineering expert, thought the idea didn't make a whole lot of sense based on the design of the fruit fly. "People have thought the wings might contribute to scent detection, but the antennae, the bug's primary scent trackers, are perched atop its head, well in front of the wings," he said. "Imagine a speed boat skimming across a calm lake; its bow is always hitting the calm water, ahead of the wake and the turbulence generated by the propeller—why wouldn't the antennae be on the tail, catching all the scents downwind from the wings?" said Zhao, an associate professor of otolaryngology at Ohio State. "These tiny insects have limited energy and they must use it well or they'll die, so the wing has to be very efficient," he said. "We thought, 'Why not simulate an odor plume and see what the wing is doing to it?'" Zhao said. What they saw was fascinating. The bug's wings don't just flap up and down—there's a dip forward and up as the wings approach the fruit fly's head, a motion that appears to "scoop" streams of odor right to the insect's antennae. "We can see that the insect's wings could help it detect food, survive, and find mates," Li said. They didn't stop there. The researchers wondered: "Does that mean the wing wasn't designed by nature strictly for aerodynamic performance?" The bottom section of wing, they saw, seemed to be important for the odor "scoop," so Zhao and Li wondered if they could alter this structure and find out more about whether it would hinder speedy flight for the fruit fly. The new model didn't hinder flight. In fact, it improved the efficiency of the already-racing wings of the fruit fly, which usually beat at about 200 hertz, the equivalent of about 12,000 revolutions per minute. But the wing alterations rendered the computer-simulated insect's wings much less successful at redirecting scents to the antennae. Plumes that were drawn in and up before sailed right past the virtual bug. That led the researchers to speculate that the fruit fly's wings evolved to support two of its life needs: fast transport and detection of the faint odors in its atmosphere. "The structure of the wing does not appear to be optimal for aerodynamics, even though they are amazing fliers," Zhao said. "Odor is very important for insects, and this study seems to suggest that the wings balance the need for that as well." The research could inform future engineering studies modeled on nature's fliers, particularly work to refine drones, Zhao said. In fact, there could be applications related to military drones designed to "smell" threats, such as bombs or chemical weapons, he said.